This parcel offered developers 334 unbuilt acres for new homes, but also the task of mitigating noise from highway traffic and nearby Andrew’s Air Force Base. Additionally, local zoning authorities required documentation from a professional engineer with expertise in acoustical analysis. Our team’s approach began with a 24-hour survey of traffic noise from adjacent Route 5/301. The data allowed us to calibrate a detailed noise model based on Federal Highway Administration standards. 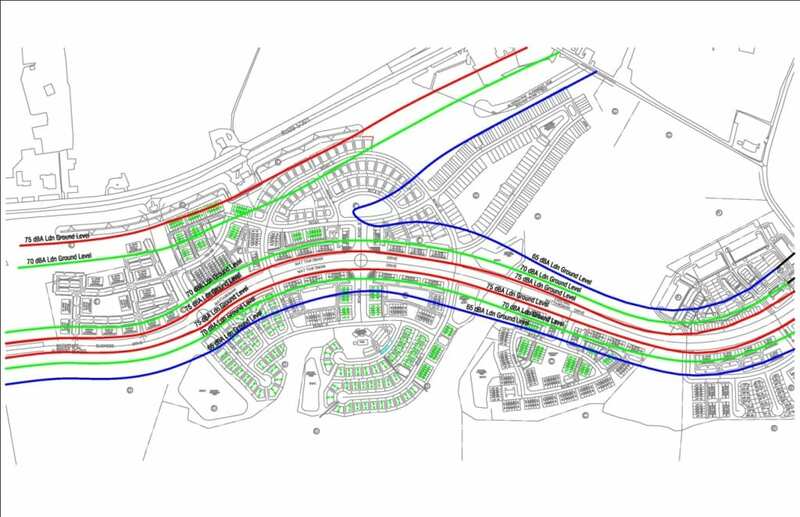 Our work revealed the current and projected noise levels across the site, resulting in noise contours showing exactly where the impact to new homes would be the greatest. To account for the Air Force base, we incorporated Andrews’ most recent AICUZ noise contours into our estimates of total noise levels that the builder would encounter across the site. The depth of the data we provided helped the project’s owner, Timothy Brandywine Investments One, LLC, account for potential noise issues well before finalizing their plans for the site. Based on our research, Phoenix Noise and Vibration was able to recommend layout changes that allowed buildings to shield outdoor activity areas from traffic noise. We also provided general recommendations to mitigate interior noise levels the builders now know to expect.